Introduction: Parotid gland is the commonest site of salivary gland neoplasms. Case definition: Neoplasms of parotid gland may be benign or malignant. Differential diagnosis: Skin, soft tissue and lymph node swellings form an important differential diagnosis of parotid neoplasm. 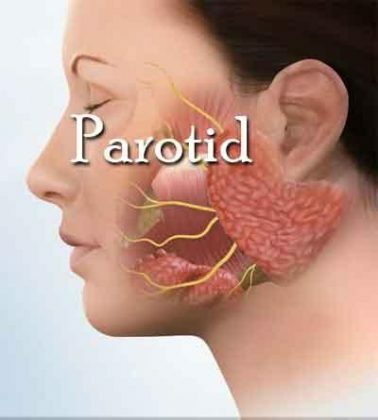 Prevention and counseling: Parotid lesions should be investigated and treated early to prevent morbidity of facial nerve injury and mortality due to advanced parotid malignancy. Painless, slow growing swelling in front of or below the ear. Occasionally, there may be a bulge in the tonsillar region if deep lobe is involved. Presence of pain or facial paralysis may suggest malignancy. Fine Needle Aspiration Cytology is necessary to confirm the diagnosis and as a prelude to radical parotidectomy. Superficial parotidectomy is the treatment of choice for benign neoplasms located in the superficial lobe of parotid. Isolated deep parotidectomy or total parotidectomy with preservation of facial nerve is indicated for benign neoplasms located in the deep lobe of parotid. For malignant neoplasms of the parotid gland total parotidectomy with excision of adjacent involved structures, facial nerve and ipsilateral neck dissection, if required, should be done. Referral criteria: Patient should be referred to a higher center if frozen section or nerve grafting of the facial nerve are anticipated. CECT/ MRI should be done to evaluate the nature of lesion, involvement of adjacent structures and presence of significant lymphadenopathy. For malignant neoplasms of the parotid gland total parotidectomy with excision of adjacent involved structures, facial nerve and ipsilateral neck dissection, if required, should be done. iv. Ipsilateral neck dissection is indicated in the presence of significant lymphadenopathy. v. Frozen section biopsy is indicated if operative findings are suspicious of malignancy, even if it was not suspected preoperatively. Nerve grafting should be done when facial nerve needs excision. Clinical evaluation, treatment planning and execution. Assisting in evaluation and treatment. Assisting in investigations and operation. we are ultimately being compelled to refer all cases for HIGHER CENTERS . Because of huge burden in GOVT SETup & long waiting periods, PATIENTS WHO ARE REFUSED TREATMENT DUE TO STRINGENT GUIDELINES& LITIGATION CHANCES WILL ULTI MATELY be COMPELLED TO GO TO PRIVATE COSTLY HIGHER CENTERS OF CORPORATE SECTOR.To benefit THE CORPORATES THE DESIGN IS HERE. But where is d scientific study and its results to back ur recommendations??? All these are known Western recommendations. Nothing new. How do these apply to our Indian people with completely diverse body and environment?? ?